6 Where Do You Go? Kevin Kane's songs, voice, and guitar playing are very familiar to any Canadian to have turned on a radio or TV between the mid-80s and early 90s, for at the time his band The Grapes of Wrath rode a wave of hit singles, videos, albums and sold out concerts from coast to coast. 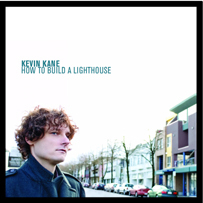 How To Build a Lighthouse is Kevin's first full-band recording since the Grapes days and finds him joined by Nelson Bragg (Mockers, Brian Wilson Band) on drums, Stefan Bienz on upright and longhorn bass, and Christina Zaenker's layered cellos and vocals. It is Kevin's most varied and dynamic collection of music and was produced by Kevin, mixed by Steven Drake (The Odds, The Tragically Hip, 54-40), and mastered by Kramer (Low, Galaxy 500). Since his birth in the mid-60s, Kevin Kane has had an affinity the music of that era. Growing up in Kelowna, BC, he met brothers Chris and Tom Hooper, who shared his love of the Who, the Rolling Stones, the Kinks, and especially the Beatles. Inspired by the DIY attitude and immediacy of the blossoming punk rock and new wave movement, the three drove to Vancouver for a weekend to record their self-titled debut EP and within a couple of months, The Grapes Of Wrath themselves signed to the newly-formed Nettwerk label. The band went on to release 4 albums internationally through EMI, beginning with September Bowl Of Green (1985), gold-certified Treehouse (1987), and concluding with the platinum-selling Now and Again (1989) and These Days (1991). The Grapes disbanded the following year, but reformed from 1998 and 2001, releasing Field Trip on a now-defunct label. Aside from his work with the Grapes of Wrath, Kevin has released 2 solo acoustic albums, both of which met with critical acclaim and enthusiasm from Grapes fans and a whole new audience who have discovered Kevin's quiet, artful song-writing and sparse acoustic arrangements. Neighborhood Watch was released in 1996, and more recently, in 2001 Kevin recorded an album of covers, paired-down to just his voice and acoustic guitar, called Timmy Loved Judas Priest (with guests Veda Hille & Neko Case). Kevin has also developed a strong reputation as a producer, working with artists like Zumpano, The Salteens, Star Collector, The Capitals, Superconductor, etc. The Grapes brand of elegant understated pop pre-dated today's return to earthier harmonic roots music. Kevin Kane does not disappoint. This CD is exactly how you'd expect a Grapes of Wrath CD to sound like today.